in the 15th minute with his second goal of the season. HOUSTON, TEXAS (September 28, 2014) The Houston Dynamo kept their playoff hopes alive on Sunday, September 28, 2014 with a 2-0 win over the Chicago Fire in front of 20,262 fans at BBVA Compass Stadium. The Dynamo is currently in eighth place in Eastern Division of Major league Soccer with five games remaining in the 2014 season. With the win, they erased their season record to 10-13-6 for 36 points. Philadelphia is currently in seventh place with 38 points and sixth place is held by Toronto with 42 points. D.C. United leads the Eastern Division with a 15-9-6 record and 51 points. In the 15th minute, midfielder Ricardo Clark deftly gets by his defender and comes across the pitch, feeding it to forward Omar Cummings. The fleet-footed Cummings, who hails from Old Harbor, Jamaica, quickly split his two defenders and sent the ball into the goal past goalkeeper Sean Johnson. It was the Cummings’ second goal of the season and 40th of his MLS career. The Dynamo doubled their lead in the 67th minute when midfielder Brad Davis and defender Kofi Sarkodie teamed up to feed Boniek Garcia the ball for the score. Davis crossed the ball to Sarkodie, who quickly headed it to Garcia for the score. The goal was the Honduran’s second of the season and the 62nd of his career. The assists were Davis’ tenth and Sarkodie’s third of the season. Next on tap for Houston is a 6 p.m. road game against the New York Red Bull on Saturday, October 4, 2014. They will play Toronto on the road on Wednesday, October 8 before returning home on Sunday, October 12 to face New England. and 17 on day two action. 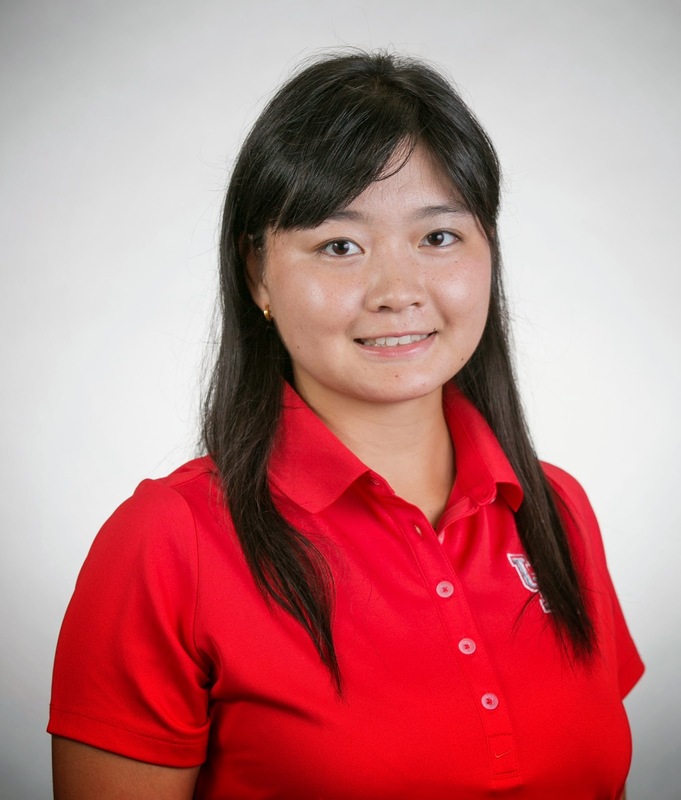 EAST LANSING, MICHIGAN (September 13, 2014) University of Houston freshmen Yuka Kajiki and Megan Thothong stood among the top-10 individual leaders following the first 36 holes of the Mary Fossum Invitational to lead the Cougars into a tie for fourth place in the team standings. The Cougars posted a score of 614 to tie for fourth with Michigan after the first two rounds on the 6,236-yard, par-72 layout at Forest Akers West Golf Course. Houston posted a team score of 314 in Saturday’s morning round and then bettered that total by 14 strokes with a 300 in the afternoon session. Both Kajiki and Thothong are competing in only the second collegiate events of their careers. 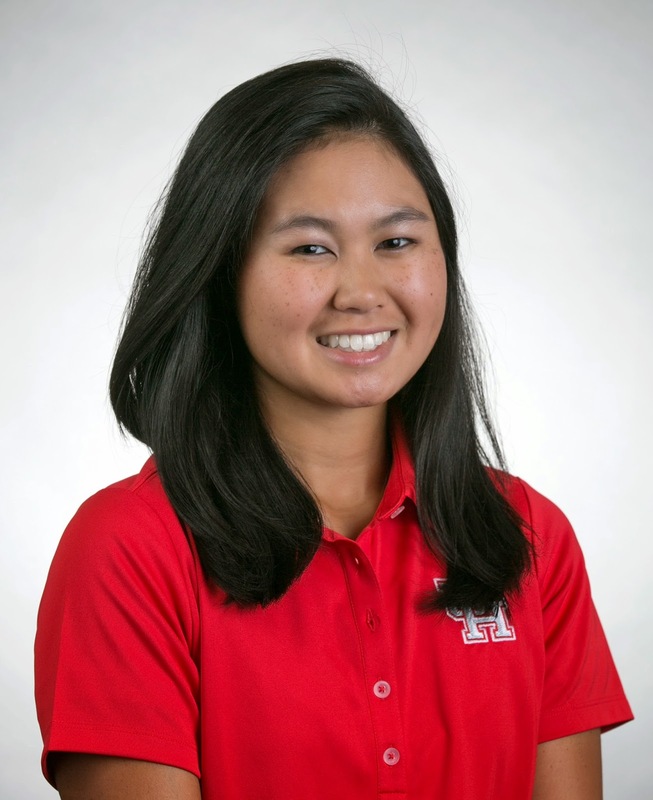 Kajiki, who finished in a tie for 30th at The “Mo”Morial earlier this week in Bryan, Texas, led the way with a score of 4-over-par 148 to stand in fourth place. The Hiroshima, Japan, native started her day with a birdie on the par-4 third hole and battled through six bogeys for a 76 in the morning round. Kajiki enjoyed an even-par 72 in the second round of the day, draining birdies on Nos. 5 and 17 with only two bogeys on her scorecard. and followed with a 72 in the afternoon round, which included three birdies in a five-hole stretch . Junior Raegan Bremer was tied for 25th with a score of 156, while sophomore Emily Gilbreth was tied for 40th at 160. Freshman Maddy Rayner stood in 71st at 165. Host Michigan State held the first-day lead with a score of 23-over-par 599, six strokes ahead of Notre Dame. Toledo stood in third at 609 with FIU (619), East Tennessee State (624), Western Michigan (632), Grand Valley (633) and Oakland (633) rounding out the top-10 team leaders. Individually, Michigan State’s Sarah Burnham held the first-day lead at 1-over-par 145, with Grand Valley’s Gabrielle Shipley in second at 146. FIU’s Meghan MacLaren stood in third at 147. The Final Round begins with a 7:30 a.m. (CDT) shotgun start Sunday. The Cougars will compete in threesomes with student-athletes from Michigan and FIU. Abilene Christian on Family Weekend. Bears overcome Huskies with two 4th quarter scores. GREELEY, COLORADO (September 13, 2014) The HBU Huskies took a 20-15 lead into the fourth quarter, but Northern Colorado scored a pair of unanswered touchdowns over the final 10 minutes to pull out a 28-20 victory over the Huskies Saturday afternoon at Nottingham Field. Sophomore quarterback Jonathan Fleming completed 21-of-35 passes for 159 yards and was intercepted three times for HBU (0-2). Freshman running back B.J. Kelly carried 11 times for 46 yards, while freshman Larry Day had seven carries for 36 yards and a touchdown. Freshman wide receiver Wesley Lewis made eight catches for 65 yards, and senior tight end Kenneth Bibbins had six catches for 42 yards. The Huskies’ defense was solid, led by freshman linebacker Garrett Dolan’s 17 tackles and 1.5 sacks. Freshman linebacker Terrell Brown III added nine tackles, while junior defensive end Josh Jones recorded a sack and a forced fumble, which was returned by sophomore cornerback Eric Amoako for a touchdown. Northern Colorado quarterback Sean Rubalcaba was 11-for-17 for 178 yards and a touchdown, and also rushed 13 times for 58 yards and a score for the Bears (1-1). Robert Holland rushed 16 times for 87 yards and a touchdown, while Darius Graham rushed for 58 yards and a touchdown. Stephen Miller made four catches for 58 yards, and Dimitri Stimphil had three receptions for 61 yards and a touchdown. HBU’s defense forced a three-and-out on Northern Colorado’s opening possession of the game, and a bad snap on the ensuing punt gave the Huskies great field position. Junior kicker gave HBU an early 3-0 lead with a 35-yard field goal with 11:10 to go in the first quarter. After freshman punter Christian Guzman pinned Northern Colorado back at the 4-yard line with a 56-yard punt, the Bears drove 96 yards on seven plays, capped by Rubalcaba’s 50-yard touchdown for a 7-3 lead with 2:16 remaining. The Huskies answered with a 14-play, 78-play drive, which ended with Day’s four-yard scamper into the endzone to put HBU back up, 10-7. HBU’s defense held and gave the ball back to the offense with a chance to put points on the board before halftime, but Kyle Griffin’s interception and return down to the HBU 11 set up a 2-yard TD run by Holland. Thomas Singleton ran in the two-point conversion out of the wildcat to put Northern Colorado ahead 15-10 heading into halftime. In the third quarter, Jones’ blindsided Rubalcaba for a sack, jarring the ball loose. Amoako scooped it up and returned it 31 yards for a touchdown that put HBU ahead, 17-15. Shinn then added a 24-yard field goal with 16 seconds left in the quarter to give HBU a 20-15 lead. In the Bears’ drive at the start of the fourth quarter, Rubalcaba hit Stephen Miller for a 23-yard completion, Brandon Cartage added a 12-yard first-down run, and Holland had a 19-yard carry down to the HBU 4 to set up Rubalcaba’s 2-yard TD on a quarterback sneak. Northern Colorado once again went for two, but were stopped as they clung to a one-point lead. Northern Colorado got the ball back at midfield with 8:46 left and took four minutes off the clock on a drive that ended with Graham’s seven-yard TD. The extra point gave the Bears a 28-20 lead. On the Huskies’ final drive, Fleming completed 6-of-8 passes to get them to a third-and-goal at the 7. Fleming found a wide open Bibbins in the endzone for an apparent touchdown with 44 seconds left, but HBU was called for offensive pass interference, moving the ball back to the 22-yard line. Fleming was intercepted by Jaqueal Walker, and the Bears ran out the remaining 33 ticks. 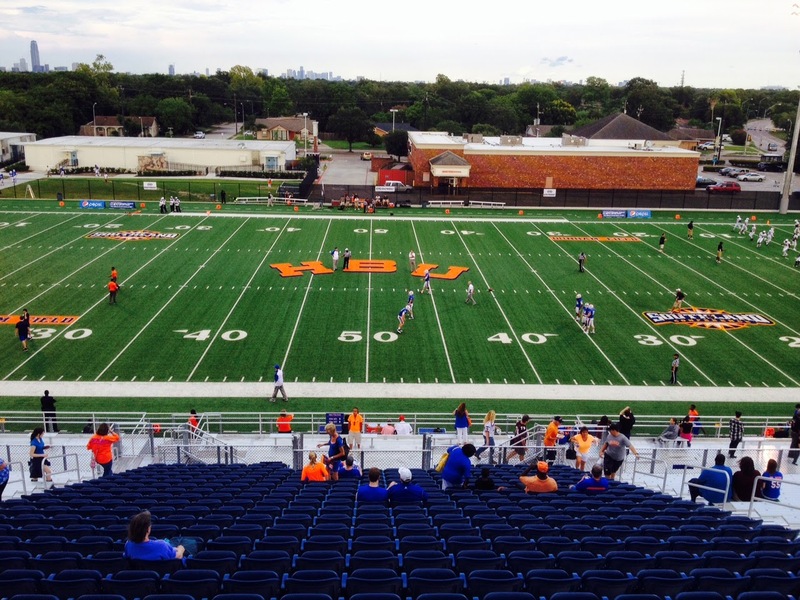 HBU returns to action when it travels to face Texas College Saturday, Sept. 20 at noon at Trinity Mother Frances Rose Stadium in Tyler, Texas. Senior outside hitter Megan McStravick takes All-Tournament for the Huskies. ARLINGTON, TEXAS (September 13, 2014) HBU senior outside hitter Megan McStravick recorded eight kills and eight digs for HBU in their 3-0 (25-14, 25-23, 26-24) drop to UTA in the final match of the UT-Arlington Tournament Saturday afternoon. Junior middle blocker Allison Doerpinghaus recorded a match-high of eight block assists for the Huskies. Sophomore setter Kayla Armer had 25 assists for HBU (4-6). Senior libero Haley Hoffman recorded 14 digs, while sophomore defensive specialist Beth Shecterle had 11 digs. Qiana Canete led UTA with a double-double of 13 kills and 10 digs. Taylor Gross recorded 11 kills, along with seven block assists for the Mavericks. Amanda Welsh had 29 assists for UTA, while Cassidy Wheeler had 12. Caitlyn Cooney recorded a match-high of 19 digs, while Ashlynn Ford had 10 digs for the Mavericks. The Mavericks outblocked the Huskies 12.5-9. UTA outhit HBU 49-33. The Huskies fell short by eight digs against the Mavericks. The following are the All-Tournament selections from this weekend: Kali Fluke, TSU; Megan McStravick, HBU; Olivia Mesner, FGCU; Whitney Masters, FGCU; Qiana Canete, UTA; Taylor Gross, UTA; Briana Sharratt, UTA. The Huskies return to action at home on Tuesday, Sept. 16 against Prairie View A&M in Sharp Gym. Huskies sweep TSU, fall to FGCU. ARLINGTON, TEXAS (September 12, 2014) HBU senior outside hitter Bailey Keith leads the Huskies with 15 kills against Texas Southern University at the UT-Arlington Tournament Friday evening at College Park Center. The Huskies defeated TSU 3-0 (25-22, 25-14, 25-21) Friday evening. Keith led HBU (4-5) with a match-high of 15 kills and seven digs. Senior outside hitter Megan McStravick recorded nine kills and nine digs for the Huskies. Sophomore setter Kayla Armer had a match-high of 42 assists. Senior libero Haley Hoffman had 13 digs, while sophomore outside hitter Jessica Wooten had 10 digs for the Huskies. Audriana Carson recorded 10 kills and 12 digs for the Tigers. Robyn Shannon had 10 kills for TSU. Sarah Wooten recorded 21 assists for the Tigers. Samone Boyd recorded a match-high of 14 digs for TSU, while Wooten recorded seven digs. The Huskies outblocked the Tigers 7-4. HBU outhit TSU 47-35. The Tigers fell short of just 10 total digs to the Huskies. The Huskies dropped 0-3 (25-17, 25-22, 25-20) to Florida Gulf Coast. Wooten led the Huskies with 13 kills, while junior Allison Doerpinghaus had six kills. Hoffman recorded a match-high of 15 digs for HBU, while McStravick recorded 11 digs. Armer had 27 assists for the Huskies, along with three block assists. Freshman middle blocker Blair Gillard had five kills for HBU. Jessica Barnes led the Eagles with a match-high of 15 kills. Vanessa Benke recorded 14 kills and 14 digs, while Elenora Kazarian had 10 kills for Florida Gulf Coast. Gigi Meyer had 47 assists for the Eagles. Courtney Stephens recorded 10 digs for FGCU. The Eagles outblocked the Huskies 6-5. FGCU also outhit HBU 52-31. The Huskies fell short by just seven digs to the Eagles. The Huskies return to action to conclude the UT-Arlington Tournament Saturday afternoon at 2 p.m. against UT-Arlington. HOUSTON, TEXAS (January 12, 2014) The Houston Livestock Show and Rodeo will release the performance lineup for the 2014 edition of Rodeo Houston on Sunday evening, January 12, 2014 at 11:59 p.m. The announcement will be made via Facebook, Twitter, e-mail and text alerts, along by general press release through local and national media outlooks. Rodeo Houston will run from March 4 through March 23, 2014 on the grounds of Reliant Park in Houston. The daily rodeo competition and concerts will be held in Reliant Stadium with other rodeo and livestock show events scheduled forReliant Arena and Reliant Center. Performances by country entertainers are scheduled for 14 days, with R&B, classic rock, pop/rock, and Tejano music taking up the remaining seven days. The livestock show and rodeo will be proceeded by World’s Championship Bar-B-Cue Contest on February 26 to March 1. In the past, RodeoHouston has presented a great selection of performers which is certain to continue in 2014. Country favorite Trace Adkins performed in 1997, 1998, 2009, and 2011, in addition to Alabama (1986, 1988-1992, 1996, 1998, 2001, 2003, 2012), Kenny Chesney (2001-2005, 2010, 2013) and Tim McGraw (1996-1997, 2003, 2008, 2010-2011, 2013). Others who have graced the stage at RodeoHouston include Bruno Mars (2013), Emilio (1990, 1995-1997, 1999, 2007), Chicago (1987, 1989, 1990), KISS (2011) and Gladys Knight (1994, 1996, 20901, 2009). In addition to the performances on the rotating stage inside Reliant Stadium, rodeo fans who are 21-years-old and over can listen some of the best local and Texas music performers in The Hideout. The Hideout will be open from March 4-23, 2014 and is located in the big white tent on the east side of Reliant Astrodome and will be open from 6 p.m. to midnight on Sunday through Thursday and from 6 p.m. to 1 a.m. on Friday and Saturday. The Aggies were 2-0 against the Sun Devils prior to the game. In 1998, the Aggies won their first game against the Sun Devils with a score of 3-1. 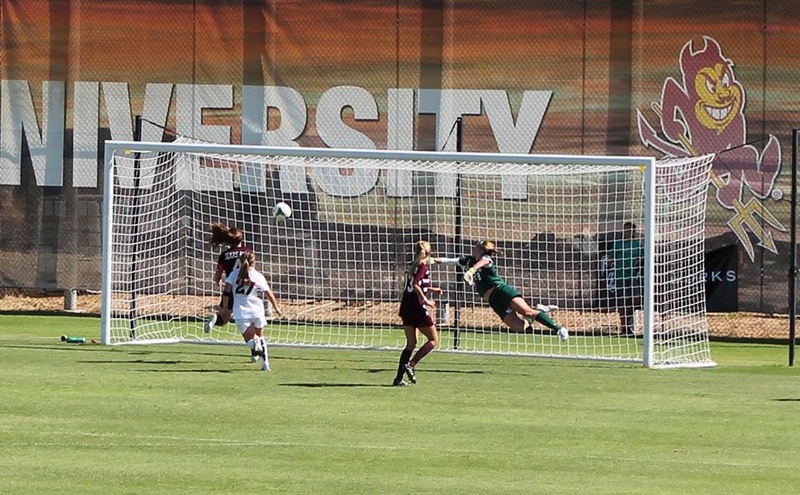 Last year, the Aggies won a commanding victory over the Sun Devils 3-1 at Ellis Field in College Station. 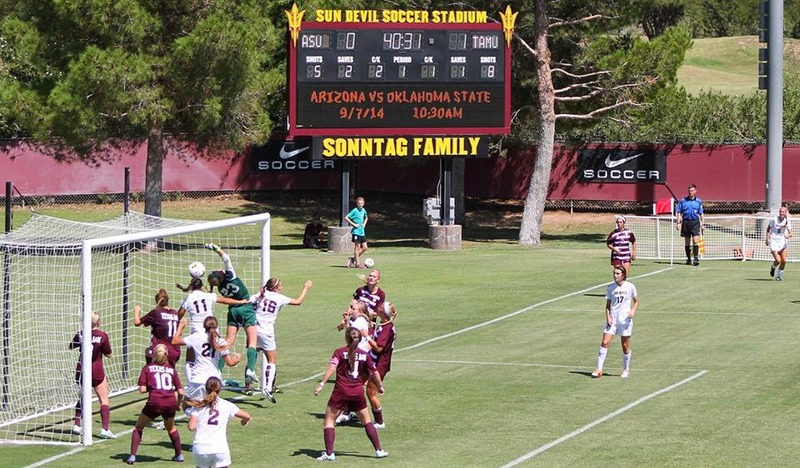 On this afternoon, with the temperatures reached 102 degrees in Sun Devil Soccer Stadium, the Aggies were unable to keep up with the sun and the Sun Devils. In the stands packed with fans from both teams, cold water was as valuable as shade. Where there was an umbrella or shade structure, fans huddled for protection. Where there was a water source, fans would get inline and pay up to $7 a bottle. On the field, the Aggies took an early lead when mid-fielder Mikaela Harvey passed to forward Kelley Monogue who scored in the 4th minute. Tommi Goodman; which was headed into the goal by Rachel Ometer. 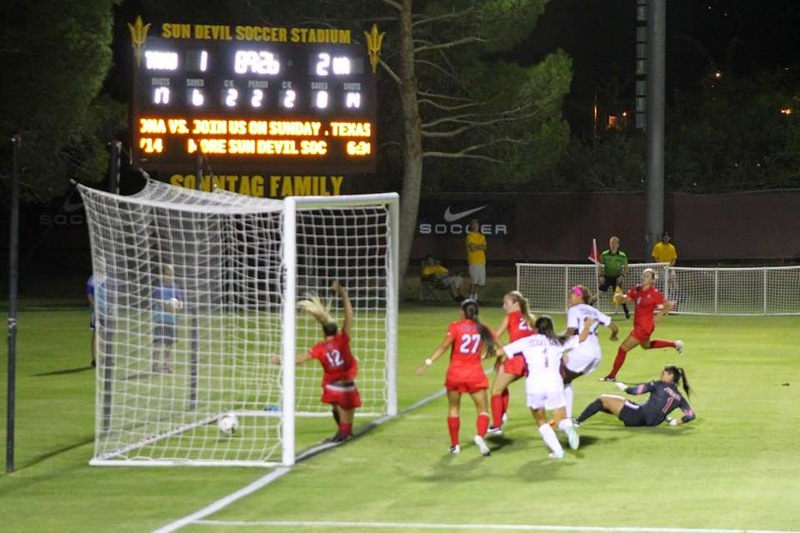 The Sun Devils would score again in the 88th minute with a chip shot over the goalkeeper by Mackenzie Semerad. She was assisted by forward Jessica Raybe. The Aggies next game will be Thursday night at 7 p.m. at home against FGCU. It will be viewable on the SEC Network and radio at 1150 AM. one touchdown against Grambling State. HOUSTON, TEXAS (September 7, 2014) The Houston Cougars came into TDECU Stadium on Saturday evening looking for their first win in their new on-campus stadium. Little did anyone comprehend on that September 6, 2014 evening that it would be such a complete and total victory. Capitalizing on a totally ineffective Grambling offense and tallying 477 yards of total offense, the Cougars run away from the Tigers with a 47-0 win in front of 30,081 fans. As a team, Houston rushed for 295 yards on 40 carries and scored three touchdowns, while passing for 202 yards and one touchdown. It was a complete team effort of the Cougars, with seven players carrying the ball and seven players catching the ball to contribute to the offensive effort. Kicker Kyle Bullard connected on four field goals of 42, 38, 35, and 21 yards to lead the scoring for the Cougars. He also added five extra points to his scoring total. Running back Kenneth Farrow carried the back 13 times for 133 yards for one touchdown while Javin Webb accounted for 72 yards on eight carries. Quarterback John O'Korn completed 14-of-25 passes for 200 yards and one touchdowns. Greg Ward Jr. and Billy Cosh also saw game time as the quarterback. The Cougars started off the game by scoring their first touchdown a mire 38 seconds into the contest, when Ward, Jr. scored on a 12-yard run, followed by a Bullard kick, to give Houston a quick 7-0 lead. Bullard followed that with first two of his four of his field goals, while scoring runs by Farrow and Ryan Jackson added to the Houston score. Ward Jr. added a touchdown pass from O'Korn right before the half to give the Cougars a 34-0 as both teams headed to the locker room. Bullard's last two field goals and a Vincent Hall fumble recovery, which he carried into the end zone for a touchdown rounded out Houston’s scoring in the game. Houston win next face BYU on Thursday, September 11, 2014 in Utah. HOUSTON, TEXAS (September 7, 2014) The Houston Baptist Huskies recorded 324 yards of total offense, but it was not enough to overcome McMurry University as they fell to the War Hawks by the score of 26-17 in their inaugural game at Dunham Field on Saturday, September 6, 2014. The Huskies got on the scoreboard first with a 38-yard field goal by Travis Shinn at the 11:47 mark in the first quarter. McMurry responded three minutes later with a six-yard run by Chris Simpson and the extra point by Joey Silva to make the score 7-3 in favor of the War Hawks. Aggressive defensive play by HBU enabled linebacker Josh Jones to score a safety with 5:48 left in the first quarter to give HBU two more points. 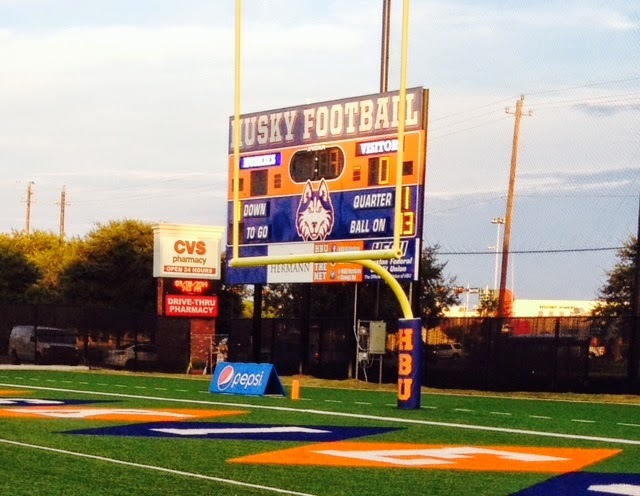 The Huskies closed out the first quarter with a Shinn 28-yard field goal to make the score 8-7 in favor of HBU. McMurry scored their second touchdown in the second quarter when Jeret Smith scampered five yards for the six points. Silva's extra point was blocked; allowing War Hawks to take a 13-8 lead into the locker room at halftime. HBU added an addition touchdown and a field goal in the second half to round out their scoring. McMurry added two aerial touchdowns and a single extra point to secure the win. In the air, HBU quarterback Jonathan Fleming completed 20 passes on 39 attempts for 179 yards and one touchdown. Additionally, he threw one interceptions and was sacked three times. Running back B.J. Kelly carried the ball 13 times for 64 yards while Craig Bell rushed for 51 yards on nine carries. Wide receiver D'Angelo Wallace caught six passes for 61 yards and the Huskies only touchdown. Defensively for HBU, linebacker GarrettDolan accounted for 14 tackles, 12 of them unassisted, while Terrell Brown tallied 9. The Huskies will face Northern Colorado on Saturday, September 13, 2014 Greeley, Colorado. Kickoff is scheduled for 2:30 CDT. a 2-all tie against Arizona in the Sun Devil Classic. TEMPE, ARIZONA (September 5, 2014) The Texas A and M Aggies met the Arizona Wildcats for the first time in Women’s Soccer at the Sun Devil Classic Women’s Soccer Tournament on Friday, September 5. The Aggies entered the night with a 4-0 record and ranked sixth in the NCAA. That would change after two overtimes and a 2-all tie. The scoring started when Arizona’s Gabriela Stoian made an unassisted goal from the top of the box inside the far post in the 38th minute. The Aggies’ Bianca Brinson was able to sneak a goal when Annie Kunz made a quick pass in front of Arizona’s GK Gabby Kaufman during the 43rd minute. In the 84th minute, Arizona was able to take a 2-1 lead when Hannah Stevens headed a goal off a kick from Stoian. As the final seconds began to wind down, Aggies’ Brinson scored her second goal, tying the game in the 90th minute. Two overtime periods later and the game ended with a score of 2 – 2. The Aggies are now 4-0-1 for the season. The Texas A&M Aggies next match is Sunday on PAC-12 Network against the Arizona State University Sun Devils. Game time is 4 p.m. EST. HOUSTON, TEXAS (September 4, 2014) The Texas Southern Tigers raised their season record to 2-0 with a 52-14 drumming of the Texas College Steers at BBVA Compass Stadium in Houston on Thursday, September 4, 2014. The Tigers amassed a total of 529 yards of total offense and scored six touchdowns in route to the victory. combining for 284 yards in the air and four touchdowns. Christope was 12-for-16 and 138 yards with one touchdown while Small completed six passes on nine attempts for 146 yards and three touchdowns. The Tigers were also effective on the ground with six players rushing for double figure yardage. Daveonn Porter carried the ball nine times for 81 yards and two touchdowns while Christope rushed for 64 yards and one touchdown. Larry Clark caught four passes for 75 yards and one touchdown with Malik Cross catching fours passes for 51 yards and a single score. With the win, the Tigers raise their season record to 2-0. as they prepare to head to Nassau, Bahamas to face Central State-Ohio on September 13, 2014. HOUSTON, TEXAS (September 1, 2014) ESPN's Adam Schefter, via his Twitter account, is reporting that former Houston Texans and University of Houston quarterback Case Keenum has been claimed on waivers by the St. Louis Rams on Monday, September 1, 2014. Keenum (shown at right) was released by the Texans early Sunday morning after the Texans traded the New England Patriots for quarterback Ryan Mallett. 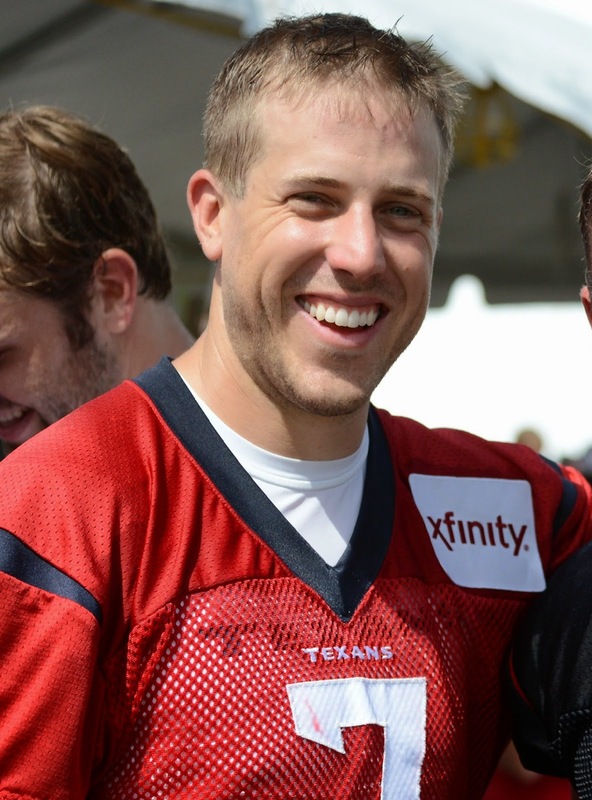 The native of Abilene, Texas, who played his high school ball at Wiley High School, Keenum, started eight games for the Texans in 2013, throwing for nine touchdowns while completing 54 percent of his passes for 1,760 yards. Keenum will likely fill the backup role for the Rams, behind Shaun Hill, due to the season ending injury sustained by Sam Bradford. Southern Mississippi product Austin Davis will join Hill and Keenum as the signal callers. Keenum and the Rams will kickoff their 2014 regular on Sunday, September 7, 2014 against the Minnesota Vikings. HOUSTON, TEXAS (September 1, 2014) It was reported by the Houston Chronicle and various news outlets around the Houston area on Saturday, August 30, 2014 that the Houston Texans has traded the New England Patriots for back-up quarterback Ryan Mallett. As a result, the Texans have released quarterback Case Keenum. Keenum, who started eight games for the Texans in 2013, completed 54 percent of his passes for 1,760 yards, in addition to nine touchdowns and was a college standout for the University of Houston, from 2006 to 2011. Mallett, who played for the Patriots from 2011 to 2013, saw limited action as Tom Brady's backup. In his three season with New England, Mallett played a total of four games, competing 1-of-4 passes for 25 yards and one interceptions, while rushing eight times for a loss of nine yards. During two pre-season games in 2014 for New England, Mallett completed 9-of-14 passes for 106 yards and one touchdown; against Philadelphia. 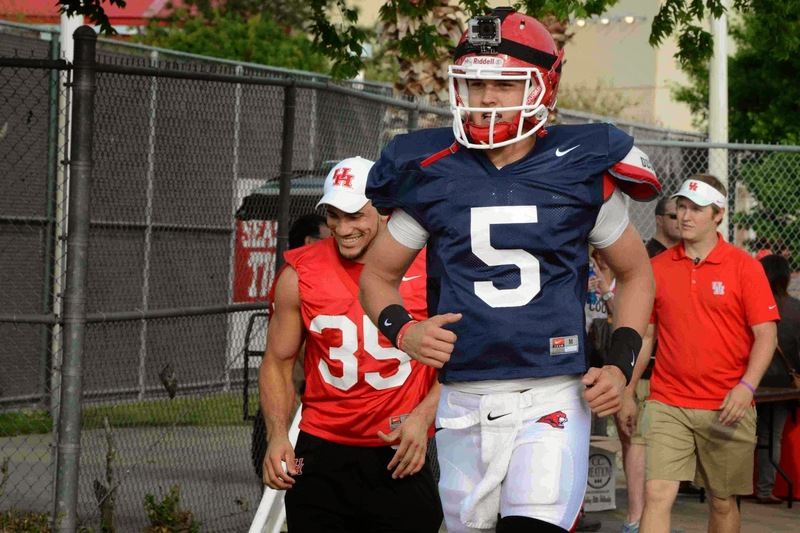 For the Texans, Mallett will be vying for the backup job, along with rookie Tom Savage, behind Ryan Fitzpatrick. The Texans kickoff their 2014 regular season on Sunday, September 7, 2014 against the Washington Redskins.